In our consumer culture, we have the ability to buy a plethora of convenience items, but does that mean that we should? Being able to go without some things or make your own versions at home will not only save you money, but also be better for the environment and your health. This list is specific to my family and lifestyle, but I hope it makes you stop and think about which products you could go without in your own life. I’m not trying to judge or say that you should never buy these products, only get people to think more about what is necessary for them and what they could do without. The truth is we don’t need as much as we think we do and simplifying the amount of products that we use is a great step toward balance and contentment. Check out my post 30 Items You Can Make at Home to Save Money for more recipes and ideas. 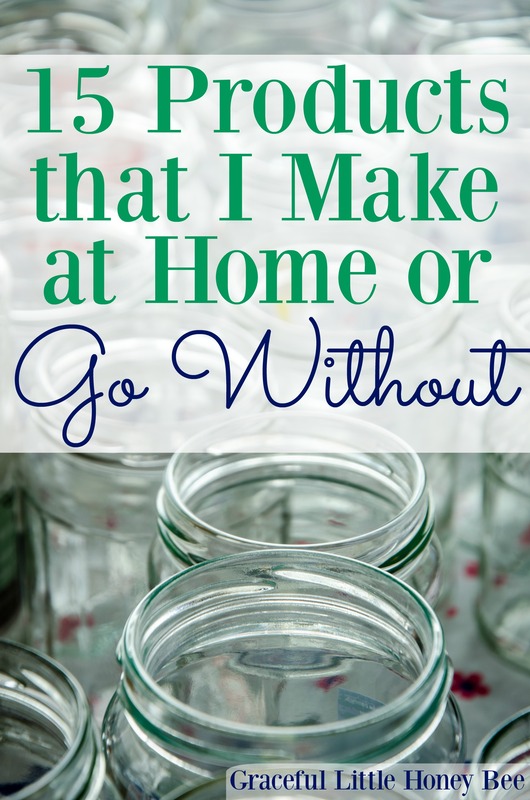 Here is my list of 15 Products that I Make at Home or Simply Go Without to Save Money. I haven’t used shaving cream in years because, why? I feel it’s a luxury in life that I can go without and I use bar soap instead which gets the job done just as well. On the same note, I rarely buy body wash because I don’t feel that it’s necessary. I have bought it in the past when I got a good deal with coupons, but for the most part I simply buy bulk packs of soap instead. I make my own powder laundry detergent for pennies per load. It’s healthy, saves me money and also saves all those plastic detergent bottles form ending up in the landfill. I’ve never used dryer sheets because I just don’t understand the need. They’re unnecessary in my opinion and cause damage to dryers, plus they’re filled with chemicals and fragrances that I just don’t care to bring into my home. I stopped buying cleaning products long ago and have since replaced them with vinegar, baking soda and water. They’re environmentally-friendly, healthy, cheap and get the job done so what’s the point of buying store-bought? If you don’t like the smell of vinegar then you can make your own Homemade Citrus Cleaner or add essential oils. I used to keep a few boxes of macaroni and cheese on hand because it was a cheap and easy dinner, but I haven’t purchased a box in ages and haven’t looked back. Having a few things on hand such as cheese, diced ham, fruit, etc. for a snacky dinner is a much healthier and quicker option for those busy nights. Also, you can try making your own with my Homestyle Mac and Cheese Casserole. I found out long ago that most store-bought broth is made from concentrated powder so it’s not worth the money. I keep chicken base powder on hand and also make my own using leftover chicken bones and veggie scraps. I really can’t stand canned biscuits. It’s just one of those things that tastes NOTHING like the homemade version in my opinion. Instead of popping the can, try making my Southern-Style Homemade Biscuits , Homemade Buttermilk Biscuits , Cinnamon Roll Biscuits or Homemade Pumpkin Biscuits instead. You won’t be sorry. I love the convenience of a lunchable, but if you stop and look at the ingredients why pay so much for meat, cheese and crackers??? Make your own at home for a more frugal, healthier option. I feed my kids homemade lunchables practically everyday for lunch. I started making my own seasonings in bulk a few years back and it’s been GREAT. I don’t have to worry about keeping those packets on hand all the time and I can control what goes into my mixes. Check out these homemade versions of Taco Seasoning, Ranch Seasoning, Chili Seasoning and Spiced Chai Seasoning. I’ve never been one to buy bottled because I prefer ice water instead. Try carrying around your own reusable bottle with you wherever you go and make it a practice not to buy plastic bottled water because it’s expensive and also plastic = bad for the environment. My kids LOVE oatmeal for breakfast, but I’m not a fan of buying those packets filled with sugar, fake flavorings and preservatives. Plus, homemade oatmeal tastes SOOO much better than instant. For a quick breakfast I mix oats, brown sugar, cinnamon and milk in a bowl the night before, pop it in the fridge and have easy soaked oatmeal ready to go the next morning. I rarely buy boxed mixes such as muffins, brownies, cornbread, cake mixes, pancake mix, etc. because they’re so easy to make at home! Plus, I enjoy cooking from scratch way more than from a prepackaged mix. Think about what you’re paying for when you buy a mix. It’s basically just flour, baking powder, sugar and salt. Couldn’t you take a few extra minutes to mix that up yourself at home? Plus, homemade baked goods are way better tasting than store-bought mixes. We drink a lot of iced-tea around here, but I normally skip the pre-made gallons of tea because it’s so much cheaper and better for the environment to brew my own. I buy the family-sized tea bags and make about a gallon per week. Plus, did you know there are so many things that you can do with tea bags once you’re done? Click here for 10 creative ideas. I won’t say that I NEVER buy individually packed snacks, but it’s pretty rare. I try to buy the bigger package of something and divide them up myself if I need too. Think of all that wasted packaging for the convenience of a pre-portioned snack. Not worth it in my opinion. What items would you add to the list? I’d love to know! Am I understanding that you don't have a need to use any dryer sheet replacement in the dryer either? Do you not have static issues? Maybe it's because I live in a dry area, but the static in our clothes would be awful if I didn't use something. I use a half dryer sheet per load, but I would like to not use even that because of the residue in my dryer. I have kind of considered those wool balls, but I'm not sure how well they work either. I do many of the same things you do. I use scrubbing bubbles for the bathroom (I know!) because we have such hard water, and I would like to get away from that, too, but haven't had much success with other things. I actually don't have a problem with static cling. I've heard that it is caused by over drying clothes so I try to take mine out right before or right when they are dry. I didn't want to spend money on the dryer balls, so I throw in two Tennis balls. But I will try to take mine out earlier like you suggested. I don't know why everyone uses a drter let your clothes dry in the sun or overnight inside. Dryers are a waist of money. Try using vinegar. Just pour about 3/4 to a cup of vinegar in the rinse cycle. It does work. Clothes come out soft and with out the residue from the laundry soap. I use it and my Mom use's it. If you forget to add during wash you can pour it onto a old piece of towel or facecloth and put it in the dryer. No smell remains when its dry. I use less than a quarter cup per load. Started doing this when my aunt was de-chemicalling her home after my uncle was diagnosed with liver cancer. The liver is a serious filter for poisons etc in our body. Vinegar works great and no smell Sheila. Dryer sheets invisibly clog your lint screen causing a fire. Go ahead, run water over the lint screen and find out for yourself just how dangerous this is to be using. The wool balls are AWESOME!!! Great list! Most of these I have been doing for years. I just started making my own laundry detergent late last year, and I still buy the occasional mac and cheese. But I don't buy more than 6 boxes a year! I too think it is healthier to made food from scratch, use less chemicals and sometimes just learn to do without! I agree with all your items on your list, however my middle son would cry if I stopped buying kraft dinner, he requested it for his Birthday. My daughter asked for boxed chicken noodle soup. I still make both homemade, but they like the box too..LOL I would add spaghetti sauce, bread , pickles and jam. This is a great list and many of the same things I have used in my own home to cut down on costs and artificial "stuff" that always seems to be lying around ;-) I recently bought a drying rack to hang all of my clothes and I have been loving it so far. As a previous dryer sheet over-user, I now prefer the smell of the air dried clothes. I love using conditioner for shaving! It gives a nice clean shave and moisturizes. I also stopped buying shaving cream. I use hair conditioner to shave instead. Stopped buying dryer sheets because the idea of those chemicals layering on my clothes freaked me out; I now add vinegar to the rinse cycle of my wash. The clothes come out just as soft and there is no smell after they dry. And I make my own general cleaner for home with water, vinegar and lavender essential oil. Works great! This comment is a reply to Sheila. I haven't used dryer sheets in years. I live in the Northeast Area of the USA and I know how you feel. The problem with dryer sheets, besides being a fire hazard, because it clogs up the lint filter, is all the toxic chemicals in them to begin with. Instead of using expensive dryer sheets, use white distilled vinegar instead. Not only will it soften your clothes, but there wont be any static cling either. I use it all the time. Never a problem. Also, the vinegar scent is gone by the time you take it out of the washing machine. The best brownie mix I have ever had I found online that had the dry mix measurements you could make ahead of time then had the wet ingredients to add when you were ready to make the brownies. Best ever homemade brownies I've had! I haven't bought paper towels in decades. Literally. Any worn out clothes that are made of 100% cotton, are cut up and used instead of paper towels. If they are used to clean up something really disgusting, they get thrown out, if no they get washed with my kitchen laundry like normal. Saves a lot of $$. Thanks for sharing! I agree that you can go without most packaged food. Breadcrumbs. I dry out any leftover bread rolls (those that don’t get turned into garlic bread) and then put them through the food processor. That way nothing gets wasted. We (my husband and I) don't buy any bottled drinking water. We are lucky that we can safely drink our tap water. We don't buy canned drinks or bottled soda either. Who needs all that sugar or sweetener? Bad for a person. We also don't buy fruit juice. Eating the fresh fruit is better than drinking the juice. i no longer buy tea bags since I heard they contain some plastic. I buy my loose tea leaves from a bulk produce co-op and they will put it into your own containers or a brown paper bag. I now buy my dish washer liquid from there and take a re-usable plastic bottle. No need for floor cleaner now that I have a steam floor mop which runs on water only. I buy a lot of my food stuffs from the co-op and take re-usable containers. Cornflakes, soy beans (I make my own soy milk from them in a soy milk maker). Seeds and nuts and so on. I no longer buy meat for me as I am mainly vegetarian these days. Hubby still eats meat though. I often make my own bread, biscuits and cakes as there is no plastic packaging involved in doing so. I also make my own soups. Very quick and easy to do. Use old towels cut up to use as cloths to wipe up spills instead of using paper towels. Wash them after. Some old towels will go to our dogs as well so that we never throw towels out. Good for drying them off on wet days and for bath days. I have also made knitted dish cloths from hemp yarn. Made several for us then a neighbour wanted a couple for herself and one for her daughter so I was happy to oblige providing they paid for the yarn. Use vinegar and lemon for cleaning down bench tops, sinks, bathrooms and stove top, bicarb of soda for toilet cleaning - don't buy bleach any more. Make your own wool balls. Take a thrift store wool sweater cut a circle shred some of the wool sweater scraps in the Center then sew it up by hand good n snug.Then repeat, Tadaa wool dryer balls. If you have a wool sweater at home you could use, all the better. Large family + Texas summer = a gallon of tea in one meal, with a bit left over for the afternoon! In addition to the advantages you mentioned, who in their right mind wants to lug those gallon jugs home from the grocery store? Not me! Something I rarely buy: ice. Make it yourself, save big. Again, who wants to carry it home? So I think I'm not only frugal, I'm also opposed to carrying more groceries than necessary - also called lazy. Kimchi and sauerkraut! I bet I can make almost a gallon of kimchi for the cost of a pint jar at the asian market.